Confession: On Thanksgiving, I don't really love eating turkey. It's true! Leftovers, though? I am all over those! I've never actually cooked a turkey--that has always been up to my mom. I am usually at her house before the meal to help pull the turkey meat apart to put in pans for serving, but I'm not dreaming of a plate piled high (partly because I don't eat a lot of meat as it is, really only on special occasions)--instead, the practical side of me is picturing the inevitable leftovers and how I'm going to use them. I eye that turkey for all of its future possibilities. Thanksgiving is really the only day of the year that we eat cooked turkey on its own, but the leftovers provide at least a few more meals later on, prepared in ways that go beyond mingling with potatoes and cranberries. no exceptions! Don't risk getting sick from unsafe food handling. I love to use these containers for freezing leftovers . One of my favorite leftover turkey recipes is Wild Rice Turkey Soup, a tradition at our house that everyone craves a couple days after the big holiday. The soup is so good! We also have a really big taste for Mexican-style flavors around here. That's how Leftover Turkey Nachos was born. After the big holiday, we've had our fill of meat and potatoes and 'soul food' type flavors. Using some leftovers for a Mexican-inspired dish really hits the spot for a post-holiday lunch or supper. This recipe makes a big layered nacho supper that everyone can scoop onto their plates and dress up with sour cream, cilantro, guacamole, hot peppers or hot sauce. It's simple food-- mild but tasty on its own but easy to spice up to each family member's liking-- and incredibly easy to put together. *note: when reheating leftovers, make sure you are getting them hot! At least 165 degrees internal temp for meats and solids; any liquid leftovers should be brought to a rolling boil. I can't emphasize enough to treat your leftovers safely so you avoid getting sick. 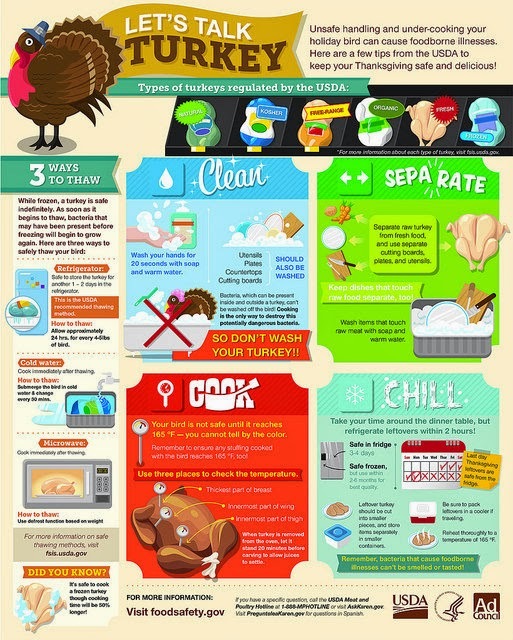 Check out foodsaftey.gov for more safe food handling tips. Here I made a half batch of turkey nachos using a smaller casserole dish because the boys needed a quick lunch. This recipe is easily halved if you just need a small lunch or snack! tasty no matter how they are put together. Homemade salsa from the garden on the second layer...yum! Enjoy your leftovers, but PLEASE...treat them properly and carefully. Place turkey in a bowl and drizzle olive oil over it. Sprinkle with cumin, garlic and chili powder, then stir with a mixing spoon, working the ingredients together and chopping the turkey into even finer shreds with your spoon as you work. Spread half the chips into the bottom of a 9x13 baking dish. Scoop the entire amount of refried beans over the chips, spreading as well as you can to make an even layer. Top with the turkey and 1 cup of cheese. Make another layer with remaining chips, then top evenly with the salsa (one to two cups, depending on your preference). Sprinkle the other cup of cheese over the top and bake for 15-20 minutes, or until the cheese melts and begins to bubble. Serve hot-- alone or with sides of sour cream, cilantro, guacamole. These nachos are awesome! ...which you'll be sure to get plenty of leftovers from! This is great! One year we had a whole leftover turkey. Somehow I started to late and the meat was not done by dinnertime. Nobody minded in my family ;). The "leftovers" were great! I made Mexican Chicken tonight and what does my daughter do? She gets out the leftover turkey and eats it instead.... But momma it is sooo good!